We provide a new lunch box for each preschooler. Bellow is our policy and information on lunches. 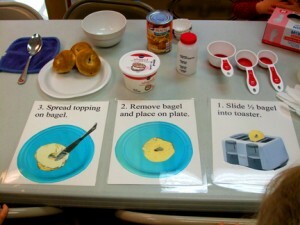 This maybe helpful for preschool parents to decide what to pack for their child’s lunch. 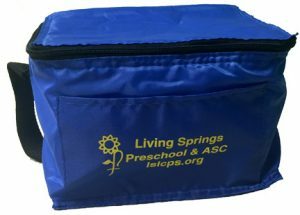 Living Springs Preschool & ASC (LSLCPS) we provide two snacks a day for full day students and one snack a day for half day students. Parents provide their child’s lunch. This is an explanation of our policy and food plan. Thank you so much parents for filling LSLCPS with healthy eaters! If you have any questions about our food policy please feel free to contact our Director Tammy Mancuso, or our Office Manager Cindy Day at 803.736.0776. – We ask that lunches come “ready to eat”. – Cold items can be kept cold with an ice pack. Many lunch ideas can be found on Pinterest. Lunch boxes will be given to each new full day student when they start preschool. If the lunch box is lost or damage, replacements are $5. 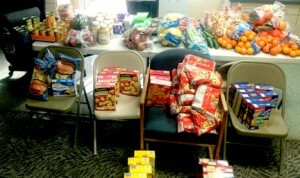 These are the snacks that were purchased for all the preschoolers this week. We do are best to provide a variety healthy snacks that the kids will enjoy. ** We follow strict guidelines to prevent food allergies, and contamination. If your child has allergies or requires special food alternatives, families are welcome to provide these outside food and/or drink. For example: At snack time, we serve milk; parents may provide lactose or dairy free milk for your child. Parents provide a Nutritional and Balanced Lunch. Please label everything with your child’s name on it. Parents can provide juice, but only 100% juice that is 4 oz or less. Cut food into small pieces to avoid choking hazard like grapes and hot dogs. Please do not pack food that young children are likely to choke on such as peanuts and popcorn. Lunchtime is between 11:30 a.m. and 12:00 p.m.
Children eat in their classrooms. Please do not send your child with extra food. 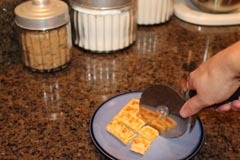 Use a pizza cutter to slice up your child’s lunch into small pieces. Works great with sandwiches and pizza of course. Children Ages 3 and up have field trips. Some trips require a brown bag lunch (a lunch that does not require heating up). LSLCPS we have large coolers and ice to keep the lunches cold. Lunches will be safely stored on the school bus until lunch time. When there is a field trip, the teachers will pass out a field trip form for parents to sign complete with field trip details. Please have your child wear sneakers on the day of the field trip. Please do not wear flip flops, sandals or Crocks. We provide Milk and snacks for all children at snack time. Common snacks are fruit, yogurt, oatmeal, cheese, and bread/crackers. All food shared with the classroom must be sealed in its original package. Examples: lunch meat from the deli still sealed; cupcakes from the grocery store bakery sealed; unopened yogurt tubes; unpeeled Cutie Clementine’s, unpeeled bananas. We are always happy when parents volunteer their time and bring food to share at LSLC CDC. Sign up sheets will be placed on your child’s classroom door for special events. 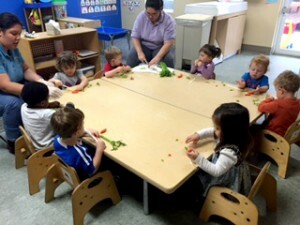 Parents can volunteer to cook special meals only here at preschool like “Week of The Young Child” Taco Tuesday Lunch. We are always happy when parents volunteer their time. Purchase a book for your child’s birthday month class celebration. Donate gifts to your child’s classroom. Children help make their snack in the 3K classroom Jumping Jungle. 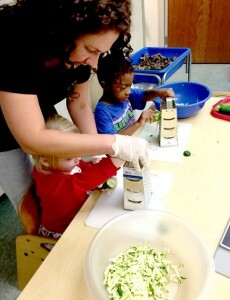 Staff provide opportunities for children to learn about nutrition 1 time per week or more. At least one teacher joins the children at the table for meals and snacks. Thank you parents for taking the time to read more about LSLCPS Nutrition Policy. We developed these guidelines to help create healthy eating habits that will last a lifetime. We have used the Food Allergy Guidelines CDC, and South Carolina’s program ABC Quality Care Nutrition Policy , USDA Choose My Plate as guides and references, along with the knowledge of our staff. All of our teachers and staff have taken continuing education classes this year on Food and Nutrition. Among our teachers & staff we have a wide range of experience, and education in early childhood nutrition. If you have any questions, or input on these policies please talk to your child’s teacher, and/or preschool director Tammy Mancuso. Your questions and comments are always welcome. Teachers have created these information sheets to make step by step instructions in baking, cooking, food prep, and even math & science lessons. Living Springs Lutheran Church Child Development Center School Zone by Rara Theme. Powered by WordPress.